The Spanish-British artist Alex Reynolds (born 1978, Bilbao) currently lives in Berlin. Her recent projects, which have included site-specific sound and performance pieces intended for single viewers, displace basic filmic elements to explore devices such as the gaze, empathy, and their manipulation. Last few weeks she was working in the guest studio of Greylight Projects Brussels. On Sunday the 17th of November Reynolds will talk about recent sound and performance works, and screen the film Spinario (24’30”, 2012). 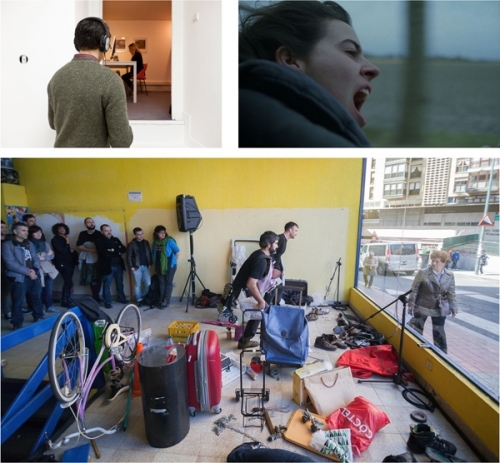 This presentation will be followed by a conversation with the artist and Sofie Van Loo (freelance curator, writer and researcher) on her artistic research and on the creation of time and space in film/ performance/ soundwork in her work.